“The King’s Speech” – which officially opens in the UK today – is a marvellous film. It compellingly, and movingly, tells the story of “How one man saved the British monarchy”, to quote its tagline. 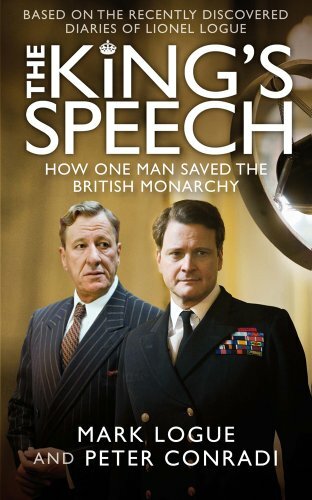 The one man in question is not the fascinating King George VI, played brilliantly by Colin Firth, but his speech therapist Lionel Logue, played just as impressively by Geoffrey Rush. Logue was an accomplished but slightly unorthodox Australian without paper qualifications who nevertheless single-handedly helped a Prince who would become King (against his own expectations and wishes!) to speak publicly despite a lifelong stammer. How did he do it? Relatively little so far seems to be known about his actual technique. However, the movie’s director Tom Hooper had access, just before filming, to archival material uncovered by Logue’s grandson Mark. His film thought-provokingly portrays Logue’s treatment as not primarily focused on the speech defect as a physical deficiency but more as a mental malaise. These are pointers to a possibility that doesn’t surface in either the movie or in the book on which it is based, Mark Logue and Peter Conradi’s excellent biography of the same name. That possibility is that Lionel Logue was to some extent dipping into a source of ideas associated with a healing practice that was rapidly spreading at the time when Logue was transformed from an actor, public speaker and teacher into a revolutionary speech therapist. That source of ideas was Christian Science, based on the healing work of Jesus, as articulated by Mary Baker Eddy in her own revolutionary book Science and Health with Key to the Scriptures. It is a spiritual approach to healing that “commences with mental causation” and roots out fear on the basis of an understanding of the nature of God as being “perfect love” as the Bible describes Him in a letter written by John. In 1996 Lionel Logue’s son Valentine wrote a letter* confirming that his father was indeed a Christian Scientist (and a Freemason). Norman Hutchinson’s biography also shares the author’s own childhood memories of Logue being talked about as a Christian Scientist when he was growing up in Perth. Logue’s approach – as portrayed in the movie – is not Christian Science practice in its purest sense, which is healing based solely on taking into account and addressing spiritual factors. The Christian Science practitioner will not additionally use physical exercises, the psychological probing of a patient’s emotional history, or other such means. While this purely spiritual approach to healing has its critics, it also has its champions, particularly those who are grateful for the spiritual and practical good they have experienced from applying its teaching to their own needs and the needs of others. Somewhere between the critics and the champions are those who might be understandably cautious about promoting something they do not fully understand. While it is quite possible that Firth didn’t know about the Christian Science connection – and wasn’t referring to that – this would have been an understandable concern if he did. Christian Science is often mistakenly assumed to be a belief in miracle healing, like the belief in getting a cure from going to Lourdes, or like the faith healing that is practised by many. And clearly, in contrast, it is historically accurate, as depicted in the movie, that Lionel Logue’s work with the Prince and then the King was not a quick cure. It was a progressive loosening of a limitation that never totally left him, although its hold over him was successfully subdued. The practice of Christian Science can, and often does, deliver quick cures, but that isn’t its driving motive. The main focus of Christian Science practice is to promote spiritual growth individually and in the community – inspiring (not forcing!) a lessening of the grip of materialism in favour of a conscious sense and growing understanding of the goodness of God and of the underlying unity of humanity. When people have healings that don’t come so quickly they often find that the resulting experience of spiritual growth is much greater and more rewarding despite the trial of having to work something out over a period of time. But whether fast or slow, recovery is seen as dependent on proving God’s consistent spiritual laws of impartial good for all, not on harbouring a faith in a God whose will could go either way. Consequently the word “miracle” doesn’t enter into the lexicon of Christian Science except as a term for what a cure that comes from a reasoned trust in the healing power of divine Love, God, is mistakenly assumed to be. In a video interview recorded by a colleague of mine, Norman Hutchinson gives an example when Lionel Logue is recorded as having turned around a speech defect in just one visit. And both Australia’s Sydney Morning Herald and The Age quote Dr Caroline Bowen, a speech and language pathologist who has researched Logue’s practice, saying ”As a Christian Scientist, Logue was passionate about healing, and perhaps this, coupled with his background in elocution, led to [his treatment of] returned servicemen who had speech disorders attributed to shell shock.” Many other aspects of Logue’s character, as portrayed in the movie, would also resonate with most Christian Scientists as being qualities they feel they have gained from the teachings – a capacity for calm in the midst of commotion, a trust in the ability of good to prevail, and an ability to exceed one’s own limited life script by virtue of that spiritual confidence. So a question waits to be more fully investigated and answered. To what degree were the prayerful, metaphysical ideas of Christian Science a part and parcel of Lionel Logue’s uncharted technique for helping the transformation of stammering Prince Albert into a competent King at such a crucial time for royalty’s part in the effort to protect the civilised world from the forces of fascism and the threat of communism? But perhaps, after all, He was. See also: The King’s Speech: Lionel Logue and the hypnotism question, and The King’s Speech: Lionel Logue and the healing question. Below is the trailer for the movie, and on the right is a special panel of links to other articles that touch on the fact that Lionel Logue was a Christian Scientist. * Letter to Ms Suzanne Edgar, Research Editor, Research School of Social Sciences, The Australian National University. ← Picture this… what do you see? Well-spoken, Tony — thank you! Bravo and bravo, Tony. Very well said. Thanks, Tony, for this excellent post. It helps answer many of the questions I’ve been receiving over the last couple of weeks. I’ll be sharing it. Tony – Thank you for this. I noted in the movie, that Lionel Logue refers to the King as a “patient” whilst he was talking with his wife in their home… that he was having difficulty with a “patient”. I’ve heard several people in my home town of Sydney, say that they’ve seen the movie twice. We all love a good news story, especially where healing is a focus. Thank you for your excellent piece on it, Tony. Hey Tony, thank you for the information about Lionel Logue. I just saw the movie tonight and was very moved and impressed by the whole thing. Lionel’s insight regarding the prince’s past and present situation was well portrayed and he maintained his position of poise, helping the future king through each stage of development, with a confidence that suggests his understanding of the innate goodness and wholeness of a person which he must have learned through his studying Christian Science. It was a pleasure to watch the film knowing this background information. A very clear article setting out the facts, showing that Logue was coming from a number of places, and giving a clearer idea of what is and what isn’t CS practice. Thanks to whoever wrote the article. Thanks, Janet. I am the author, but I had very helpful input from my Australian colleagues, and couldn’t have compiled this without them! We are continuing to explore this historical story with an open mind, to see if we can get an even clearer picture of Lionel Logue’s engagement with Christian Science. Cheers. Thanks, Tony. With all of the research on the movie and seeing the movie that I did, I appreciated your wonderful background on the film. Maybe this movie will be a way the public will recognize the worth of our Leaders discovery. Keep up the good work! Having just read the Hutchinson book and seen the movie I am profoundly grateful for this clear, unemotional, accurate statement of Christian Science. Having just read the Huchinson book and seen the superb movie, I am profoundly grateful for this clear, unemotional, accurate statement of Christian Science. Excellent, Tony. Excellent. Such clear, concise, and inspired comments are sure to be respected, shared, and understood. The light is breaking forth! I’d like to know if you think this is a pro monarchy movie that is smart and fun at a time when monarchs (of the corporate world as well) are being discovered to be pretty much the scourge of the planet through centuries? And as for monarchs being some bulwark against communism I guess you haven’t come across Anthony Sutton or any of the other sources on elites funding both sides of conflicts for profit? Thanks! Thanks for your comment, Carole. I don’t feel that “The Kings Speech” is particularly intended as a pro-monarchy movie, although it does undoubtedly throw a good light on the monarchy through the particular King and Queen it portrays. I have a feeling that the director just saw a great human interest story that would resonate with people (as it is doing!) and so pounced on the chance to bring it to life. I think that all our institutions, including royalty, have their highs and their lows and they need to be held accountable for the latter and celebrated for the former. I think that King George VI and his wife showed a lot of commendable qualities at a very difficult time. Not only as portrayed in the movie, but I have also always been moved by their commitment to staying in London during the blitz and touring the boroughs to encourage those enduring the bombing. I feel that was an important morale-booster to the British people during a terrible difficult period. I would hope that doing this faithfully could help bring healing, bringing out more of the positives in all our institutions and helping to subdue the negatives. I haven’t read Anthony Sutton’s work, but I appreciate that there are many views on the pros and cons of the monarchy! Well done, Tony! I especially loved the way you expressed this..”The main focus of Christian Science practice is to promote spiritual growth individually and in the community – inspiring (not forcing!) a lessening of the grip of materialism in favour of a conscious sense and growing understanding of the goodness of God and of the underlying unity of humanity.” My sincere thanks to you. Thank you, Dilshad! I am so grateful for that gift of spiritual growth that Christian Science gives us as we are faithful to its study and application. Cheers. I know someone who does, Pierre. If you want to send me an email to loblt@csps.com I will pass your request along to him! Cheers. Excellent movie and excellent article. Thank you for sharing Tony! I really liked how Mr. Logue was able to hold to his standards and made the Prince/King come to him for instruction and knew he could help. The movie shows that the attribute of humility can be very powerful. What a neat connection to Mary Baker Eddy and the Christian Science religion – healing not only is possible, but it is expected and comes when we only entertain thoughts of our oneness with God and let go of other thoughts that try to tell us that there is a power other than God (remember the 1st commandment and keep it holy). Keep up the good writing my friend. Tony–thank you for your very fine article (all of them, in fact–which are so well-written and backed up by great scholarship). I’d like to weigh in as saying that I teach voice and, as a student of Christian Science, it is always awe-inspiring to me to witness the ways in which Principal applies in all aspects of the acts of speaking and singing. When people come to me with vocal “problems” they wish to address, I help them with all the tools at my disposal, among which are 30+ years of training and experience in the music field as well as my humble knowledge of Christian Science (where appropriately shared, which always depends upon where the student is in his thinking). As much as I whole-heartedly acknowledge this method of treatment for disease, it would not really make sense for me to send my students to a Christian Science Practitioner (or act as one myself), any more than an Olympic running coach or a writing professor would do when approached for help in those fields. Having said that, I really feel that every part of our lives should be and is a spiritual practice of helping others. It’s just that everyone hangs a different title on his shingle–indeed, the world would be very boring if this were not so. Demonstrating spiritual healing does not have to be only about someone sitting still and thinking–action can and should be involved. This is what I felt about “The King’s Speech.” I loved the movie and related entirely to Logue’s approach (as portrayed–I have not read the books about him). I’m grateful that he applied his knowledge to helping so many people in this unique way. It is very interesting to know of his connection to CS, but even more important to remember that the laws of God can be practiced and proved by ANYONE in an infinite number of ways. I hope I have expressed this well. Thanks again for your super articles. Thanks, Cliff for your comments about humility and thanks for your sharing your own experience in this field, Jennie! That’s a really interesting addition to the conversation here…! Much appreciated. Wilian – São Paulo – Brasil. I totally enjoyed this article in reference to The King’s Speech… a great movie that shows the Principle of being to be much more than mankind humanly understands. The revelation of Logue as a student of Christian Science only helps me to realize there a many of us out here, quietly living the Truth according to our spiritual understanding. Thanks!